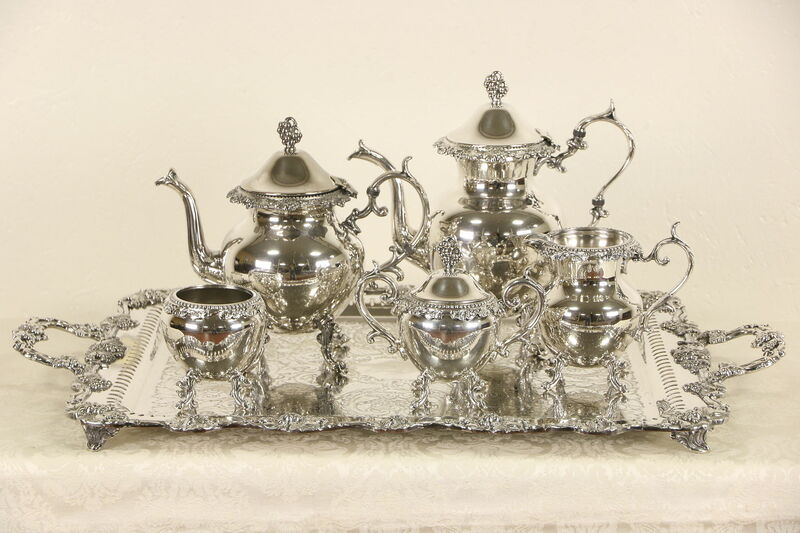 Signed "RS Co.," in the 1930's, a six piece silverplate tea and coffee service includes a coffee pot, tea pot, creamer, covered sugar, waste and large footed butler's tray. The silver is in very good condition with only minor wear on the hollow pieces, the tray is worn down to brass in several places, see photos. Grapevine motifs are beautiful on this American made vintage serving ware. Tray size is 30 1/2" long, 19" wide and 2" tall, the coffee pot is 11 1/2" tall and the smallest piece is the waste, just over 4" high.